Formation of NO by NO synthases (NOSs) strictly depends on tetrahydrobiopterin. Its structural analog, tetrahydro-4-aminobiopterin, is an inhibitor of all NOS isoenzymes, which prolongs allograft survival in acute murine cardiac rejection and prevents septic shock in the rat. In this study, we show that murine bone marrow-derived dendritic cells treated with tetrahydro-4-aminobiopterin had a reduced capacity to prime alloreactive murine T cells in oxidative mitogenesis. Checking for a possible influence on LPS-induced dendritic cell maturation, we found that tetrahydro-4-aminobiopterin down-regulated MHC class II expression and counteracted LPS-induced down-regulation of ICOS ligand, while expression of CD40, CD86, CD80, B7-H1, and B7-DC remained unchanged. Tetrahydro-4-aminobiopterin also reduced activation of CD4+ T cells isolated from mice overexpressing an OVA-specific TCR by OVA-loaded murine bone marrow-derived dendritic cells, thus indicating that its effect on MHC class II expression is involved in attenuating T cell activation. In line with affecting dendritic cell function and T cell activation, tetrahydro-4-aminobiopterin impaired production of proinflammatory cytokines and the Th1 response. With regard to cell survival, tetrahydro-4-aminobiopterin induced efficient apoptosis of murine T cells but not of murine dendritic cells. 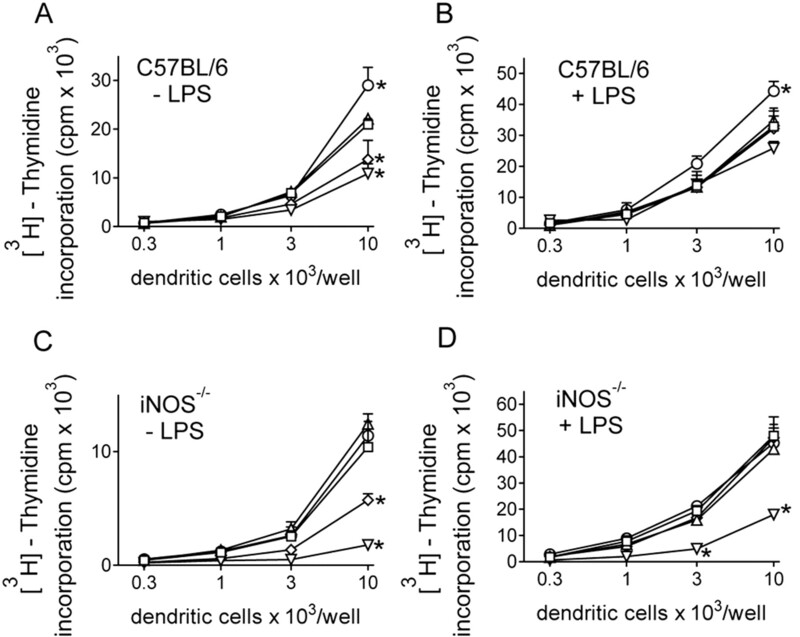 Experiments with cells from inducible NOS (iNOS) knockout mice and with N6-(1-iminoethyl)-l-lysine, a specific inhibitor of iNOS, ruled out participation of iNOS in any of the observed effects. These findings characterize attenuation of T cell stimulatory capacity of murine bone marrow-derived dendritic cells as an immunosuppressive mechanism of tetrahydro-4-aminobiopterin that is not related to its iNOS-inhibiting properties. Considering the far-ranging actions of NO in the immune response (1), inhibition of inducible NO synthase (iNOS)4 provides an obvious strategy for therapeutic intervention in states of excessive immunoactivation. One compound developed for this purpose is 2,4-diamino-6(R,S)-6-(l-erythro-1′,2′-dihydroxypropyl)-5,6,7,8-tetrahydropteridine (H4-aminobiopterin), a structural analog of (6R)-5,6,7,8-tetrahydro-l-biopterin (H4-biopterin), the natural cofactor of all NO synthase (NOS) isoenzymes (2, 3). Although H4-aminobiopterin inhibits all three NOS isoenzymes with a comparable efficacy when using purified enzyme preparations, it showed selectivity for iNOS when added to intact cells. This selectivity can be explained by the faster turnover of iNOS protein as compared with constitutive NOS isoforms and hence a more efficient binding of the pteridine to iNOS (4, 5, 6). In two animal models, H4-aminobiopterin showed beneficial pharmacological effects: in a murine cardiac allograft model of acute rejection it prolonged allograft survival with a potency comparable to high dose cyclosporin A treatment (7), and in a rat septic shock model, it protected the animals from the lethal effects of endotoxin (8). However, several lines of evidence suggest that inhibition of iNOS cannot entirely explain the immunosuppressive effect of H4-aminobiopterin. In the sepsis model, inhibition of iNOS was observed only upon continuous infusion of H4-aminobiopterin but not after the bolus dose given 2 h after LPS challenge that was sufficient to improve the 6-day survival rate. Moreover, administration of the NOS inhibitor NG-monomethyl-l-arginine that had similar effects on plasma nitrite plus nitrate levels as H4-aminobiopterin, did not improve survival rate (8). H4-Aminobiopterin also appears to be more efficient in prolonging allograft survival than other NOS inhibitors, i.e., NG-monomethyl-l-arginine that prolonged allograft survival only from 5.1 to 6.3 days (9) or aminoguanidine that prolonged allograft survival from 10.1 to 15.0 days under continuous treatment until rejection (10), whereas H4-aminobiopterin prolonged allograft survival from 8 to 14.8 days when treatment was discontinued on day 7 after transplantation (7). In a recent study, we found that, unlike H4-aminobiopterin, the iNOS-specific inhibitor N6-(1-iminoethyl)-l-lysine (l-NIL) could not prolong allograft survival despite clearly affecting plasma nitrite plus nitrate levels and reducing nitrotyrosine staining in the allografted hearts (G. Brandacher, M. Maglione, S. Schneeberger, P. Obrist, G. Thoeni, O. A. Wrulich, G. Werner-Felmayer, R. Margreiter, and E. R. Werner, unpublished data). However, in a rat cardiac allograft model, l-NIL was able to prolong allograft survival from 7 to ∼10 days under certain conditions (11). Also work with iNOS knockout (iNOS−/−) mice yielded controversial results: in one study using wild-type and iNOS−/− recipients, no involvement of inducible NO formation in rejection was observed (12), whereas in another more recent study where recipients and donor hearts were from iNOS−/− mice, participation of iNOS in the inflammatory response leading to rejection was demonstrated (13). Furthermore, participation of iNOS in developing cardiac allograft vasculopathy in the course of chronic rejection has been shown (14). Taken together, these findings illustrate that induction of iNOS contributes to but is not sufficient to develop allograft rejection. Rather, additional mechanisms that may also be affected by H4-aminobiopterin and which presumably take place before activation of T cells, formation of proinflammatory cytokines and induction of iNOS and other effectors, appear to be involved. One of the key events during an immune response is maturation of dendritic cells and priming of T cells. Therefore, to explore additional immunosuppressive properties of H4-aminobiopterin, we studied its impact on dendritic cells and their ability to stimulate alloreactive T cells. For comparison, the effects of H4-biopterin, the natural cofactor of NOSs, and of sepiapterin, a dihydropteridine that is intracellularly converted into H4-biopterin via a salvage pathway (15), were tested. To dissect effects involving inducible NO formation from those that do not require inducible NO, we compared effects of the pteridines to those of l-NIL or applied the drugs to cells isolated from iNOS−/− mice. Mice of inbred strains C57BL/6, OT-II, and BALB/c were purchased from Charles River Laboratories Germany, bred in the animal facility of the Innsbruck Medical University and used at 2–12 mo of age. CD4+ T cells from OT-II mice express a transgenic Vα2Vβ5 TCR specific for the OVA peptide 323–339 in the context of I-Ab (16). The iNOS−/− mice were from The Jackson Laboratory (obtained via Charles River Laboratories Germany). Precursors were purified from bone marrow of femurs and tibias. A total of 5 × 105 cells per well were seeded in six-well plates and cultured in 3 ml/well of RPMI 1640 supplemented with 10% (v/v) heat-inactivated FCS, 2 mM l-glutamine, 50 μM 2-ME, and 50 μg/ml gentamicin in the presence of 200 U/ml recombinant mouse GM-CSF (17) that was derived from a supernatant of the transfected plasmacytoma cell line X38-Ag8 (a kind gift from A. Lanzavecchia, Institute for Research in Biomedicine, Bellinzona, Switzerland). At day 3 of culture, an additional 3 ml of culture medium were added, and at day 6, after having replaced 3 ml of the culture medium with fresh medium, cells were treated with various test compounds at a concentration of 500 μM without or with 100 ng/ml LPS from Escherichia coli O111:B4 (Sigma-Aldrich) for further 48 h. Test compounds were H4-biopterin, H4-aminobiopterin, sepiapterin (Schircks Laboratories) and l-NIL (Alexis). Cells were washed two times with 20 ml of culture medium before mixing with T lymphocytes (see Oxidative mitogenesis). Cell preparations contained 75–80% dendritic cells, as was estimated by FACS analyses for CD11c-positive cells. T cells were purified from C57BL/6 or OT-II spleens and lymph nodes using negative magnetic separation after mechanical tissue disruption and lysis of erythrocytes with ammonium chloride. Cell suspensions were incubated with a lineage mixture consisting of mAbs anti-MHC II (clone M5.114), anti-CD45RA (clone B220), anti-Ly-6C (clone Rb6), anti-heat stable Ag (clone M1/69), and anti-NK1.1 (clone 4D11). For isolation of CD4+ T cells from OT-II mice, anti-CD8 (clone Lyt-2) was added to the Ab mix. In a next incubation step, anti-rat/anti-mouse IgG coupled to Biomag-beads (Qiagen) were used and negative fractions were collected. The resulting T cell suspension contained over 90% CD3+- or CD4+-positive T cells. C57BL/6 or iNOS−/− T cells were oxidized at 2 × 107 cells/ml with 250 μg/ml sodium periodate in PBS for 15 min at 4°C (18). Oxidative mitogenesis was set up in triplicates in 96-well plates mixing graded numbers (300, 1,000, 3,000, and 10,000 per well) of dendritic cells with 3 × 105 periodate-treated T cells thus yielding a stimulator to responder ratio of 1:30 to 1:1000. After incubation for 24 h at 37°C and 5% CO2, [3H]thymidine (1 μCi/well; New England Nuclear) was added for further 16 h. T cell proliferation was determined in a HVD Life Sciences detector after harvesting with a MACH III M Tomtec harvester (HVD Life Sciences) and solubilizing the samples with MeltiLex solid scintillator (Microsealer; PerkinElmer). In some experiments, catalase (from bovine liver; 2000–5000 U/mg protein; Sigma-Aldrich) for neutralizing possible effects of pteridines caused via hydrogen peroxide, or 50 μM hypoxanthine plus 20 μM thymidine to overcome possible effects of H4-aminobiopterin on dihydrofolate reductase activity (6), were added to the cultures. Dendritic cells pretreated with pteridines were pulsed for 2 h with 10 μM OVA peptide 323–339, which binds to I-Ab molecules. Afterward, the cells were carefully washed, and various numbers (300, 1,000, 3,000, and 10,000 per well) of dendritic cells were cocultured with 2 × 105 OT-II T cells for 48 h. [3H]Thymidine (1 μCi/well) was added for further 16 h and the proliferation of CD4+ T cells was measured by incorporation of radioactivity as described in Oxidative mitogenesis. A total of 1–3 × 105 dendritic cells treated as outlined above were incubated in 100 μl of PBS containing 1% (w/v) of BSA and various fluorescence-labeled Abs (diluted according to the suppliers instructions) for 15 min on ice. Cells were then washed with 500 μl of PBS/BSA and resuspended in 200 μl of PBS for flow cytometry using a Beckman Coulter EPICS XL/MCL 4 cl instrument (Coulter Electronics) and the EXPO32 ADC software. Abs used were labeled with FITC or PE. They were purchased either from BD Pharmingen (CD40-FITC, CD86-FITC, CD80-PE, CD11c-allophycocyanin, I-A/I-E-PE) or from eBiosciences (B7-H1-PE, B7-DC-PE, ICOS-L-PE). Isotype controls were IgG2a-FITC or IgG2b-PE (BD Pharmingen). For detecting intracellular MHC class II expression, cells were permeabilized with the Perm/wash kit from BD Pharmingen according to the manual. Immature bone-marrow derived dendritic cells on day 8 of culture were stimulated for 4 h with 1 μg/ml LPS and 5 μg/ml anti-CD40 mAb (clone H3/23; BD Pharmingen) to induce cytokine production. To prevent secretion of cytokines, 1 μg/ml brefeldin A (BD Pharmingen) was added during the whole stimulation period. For FACS analyses, cells were permeabilized with a cell permeabilization kit (An der Grub) and stained with IL-12p40/70-PE (clone C15.6), IL-10-PE (clone JES5-16E3), and TNF-α-PE (MP6-XT22) to detect cytokines in dendritic cells, which were identified by labeling with anti-CD11-allophycocyanin (HL3) mAb. To avoid possible side effects of sodium periodate treatment on cytokine production by T cells, we set up mixed lymphocyte reactions (MLRs) to check whether pteridine-treated dendritic cells affect T cell cytokine production. Allogeneic T cells were isolated from lymph nodes and spleens of BALB/c mice as described for the other mouse strains (see T cells). CD3+ T cells were cocultured with immature bone-marrow derived dendritic cells from C57BL/6 mice that had been either left untreated or were treated for 48 h with H4-aminobiopterin or H4-biopterin at 500 μM. After thoroughly washing dendritic cells, these were cocultured with the BALB/c T cells for 3 days. Supernatants were collected for determination of IL-2, IFN-γ, IL-10, and IL-4 by ELISA (BenderMed Systems). Apoptosis of dendritic cells and T cells was assessed by annexin V/propidium iodide double staining using the Annexin VFITC Apoptosis Detection kit from Alexis according to the suppliers instructions and propidium iodide (Sigma-Aldrich) added before FACS analysis at a final concentration of 1 μg/ml. Total RNA was isolated from dendritic cells with TRIzol reagent from Invitrogen Life Technologies according to the manufacturer’s protocol. Random primed cDNA was prepared using 500 ng of total RNA using Super Script II RNase H− reverse transcriptase (Invitrogen Life Technologies). Quantitative PCR was performed with TaqMan technology using an AbiPrism 7700 sequence detector (Applied Biosystems) with the Brilliant Quantitative PCR Core kit (Stratagene) and Microamp plasticware from Applied Biosystems. Probes (5′ FAM- and 3′ TAMRA-labeled) and primer sequences (selected with the Primer Express software from Applied Biosystems) were as follows: murine MHC class II Ag A, α (H2-Aa) (GenBank NM_010378): probe: 5′-TGGGAACCTGAGATTCCAGCCCC-3′; forward primer: 5′-GGAGGAGCCGGTTCTGAAAC-3′; reverse primer: 5′-CCAGGGCACAGACCACAGT-3′. Murine ICOS ligand (ICOS-L) (GenBank NM_015790): probe: 5′-TCCTTGGGAACCAGGCAGCCTGTT-3′; forward primer: 5′-GCAGCTAAAGTGTCCCTGTTTTG-3′; reverse primer: 5′-CGCTAGAAACATGGAGCTTCTTC-3′. Murine indoleamine 2,3-dioxygenase (GenBank M69109): forward primer: 5′-GGCTTTGCTCTACCACATCCAC-3′; reverse primer: 5′-TAGCCAC-AAGGACCCAGGG-3′; probe: 5′-CTGTATGCGTCGGGCAGCTCCA-3′. Murine endothelial nitric oxide synthase (GenBank NM_008713): probe 5′-CCAATGCAGTGAAGG TCTCTGCCTCA-3′; forward primer: 5′-CACCAGGAAGAAGACCTTTAAGGA-3′; reverse primer: 5′-CACACGCTTCGCCATCAC-3′. Murine neuronal nitric oxide synthase (GenBank NM_008712): probe: 5′-CAGTCTCCCGCCTCGGGCAA-3′; forward primer: 5′-CCTCAACAACCCGTATTCAGAGA-3′; reverse primer: 5′-GACTGCCATTCTTGGTAGGAGACT-3′. For normalization, a 18S ribosomal RNA probe was applied to cDNAs diluted 1/1000. All probes and primers were from Microsynth. H4-biopterin and its oxidation products H2-biopterin and biopterin were detected in supernatants or cell extracts (19) after iodine oxidation at alkaline (7,8-H2-biopterin plus biopterin) or acidic (total biopterins) pH as previously described (19). For detection of H4-aminobiopterin and its oxidation products, a protocol recently detailed in Ref.20 using MnO2 oxidation, was used. Samples were then analyzed by HPLC (20). Nitrite plus nitrate were quantified by reversed phase HPLC equipped with a cadmium reactor to reduce nitrate to nitrite and postcolumn detection of nitrite by the Griess reaction as outlined previously (20). Dendritic cells isolated from wild-type (C57BL/6) but not from iNOS−/− mice formed high amounts of nitrite plus nitrate, a measure for iNOS activity, in response to treatment with LPS (Fig. 1⇓A). Sepiapterin did not alter iNOS activity significantly (Fig. 1⇓A) because, like in other rodent cells (21), intracellular H4-biopterin levels of untreated controls were already high and obviously saturating iNOS (199.7 ± 32.4 pmol/mg, mean of four determinations ± SD). Constitutive nitrite plus nitrate production of dendritic cells from iNOS−/− mice was ∼3-fold higher than that of unstimulated dendritic cells from wild-type animals (Fig. 1⇓A). Expression of constitutive NOSs present in addition to iNOS and generating NO in the absence of inflammatory stimuli has been demonstrated in various cell types including rodent macrophages (22, 23, 24). However, in dendritic cells from both wild-type and iNOS−/− mice, endothelial nitric oxide synthase as well as neuronal nitric oxide synthase mRNA expression were close to the detection limit of ∼5 × 10−9 mRNA copies per 18 S rRNA (data not shown). 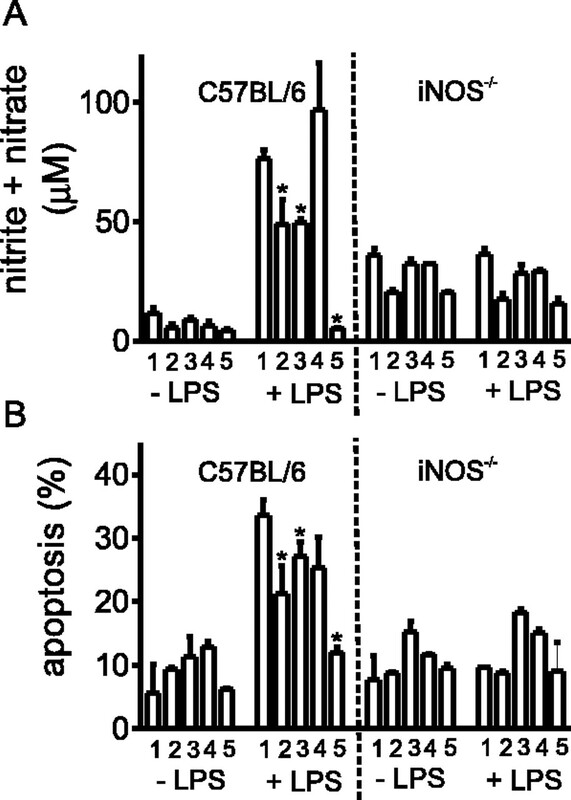 iNOS activity and apoptosis of dendritic cells in response to LPS, pteridines, and l-NIL. Dendritic cells from C57BL/6 or iNOS−/− mice were treated with 500 μM of various compounds for 48 h in the absence or presence of LPS. No compound (1), H4-biopterin (2), H4-aminobiopterin (3), sepiapterin (4), l-NIL (5). Nitrite plus nitrate was determined in supernatants (A), and apoptosis was determined using annexin V/propidium iodide double staining (B) as outlined in Materials and Methods. ∗, Statistically significant difference to untreated cells (p < 0.05 according to Student’s t test). Values are means from three independent experiments ± SD. Only in wild-type dendritic cells, LPS also caused an increase of apoptosis from ∼5–35%, which was clearly linked to NO formation because it was abolished by l-NIL and was not observed in dendritic cells from iNOS−/− mice (Fig. 1⇑B). The minor beneficial effect of pteridines on LPS-induced apoptosis of wild-type dendritic cells may be explained by their potential to oxidize NO (25, 21) as well as by their general scavenging properties (21). Dendritic cell preparations from bone-marrow cells contained between 70 and 80% of CD11c-positive cells. The percentage of CD11c-positive cells was not altered by H4-pteridines (Fig. 2⇓A). Using LPS as a maturation stimulus (24), we tested for expression of various surface markers and the influence of pteridines and l-NIL. As is shown in Fig. 2⇓, expression of CD40 as well as of MHC class II was induced by LPS in both wild-type and iNOS−/− dendritic cells. Although neither of the test compounds affected CD40 expression (Fig. 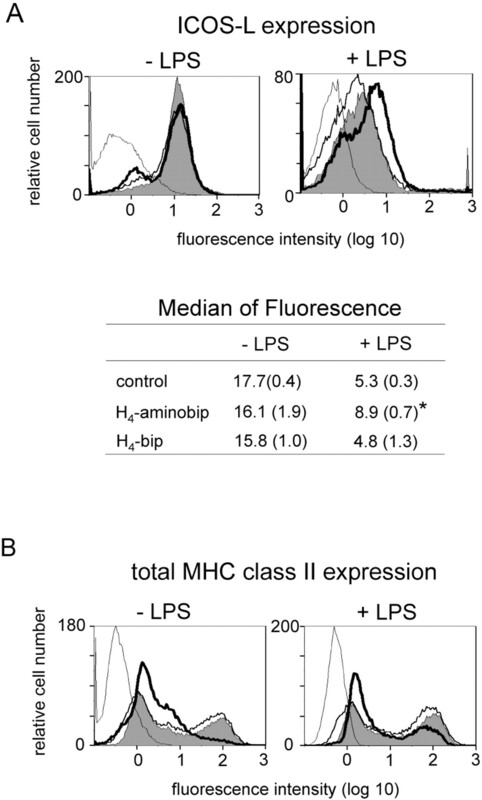 3⇓A), H4-aminobiopterin reduced MHC class II expression in cells of both mouse strains in absence or presence of LPS. In contrast, H4-biopterin, sepiapterin, and l-NIL had no such effect (Fig. 3⇓B). A comparable effect of H4-aminobiopterin on MHC class II expression was also seen when gating for CD11c-positive cells (Fig. 2⇓B). Effect of H4-pteridines on CD11c expression in cultures of C57BL/6 bone-marrow derived dendritic cells (A) and on MHC class II expression of CD11c-positive cells (B). Data shown in A are means of three independent experiments ± SD. For experimental details, see Materials and Methods. Surface expression of CD40 and MHC class II. Dendritic cells from C57BL/6 or iNOS−/− mice were treated with 500 μM of various compounds for 48 h in absence or presence of LPS. A, CD40 expression in wild-type and iNOS−/− dendritic cells. 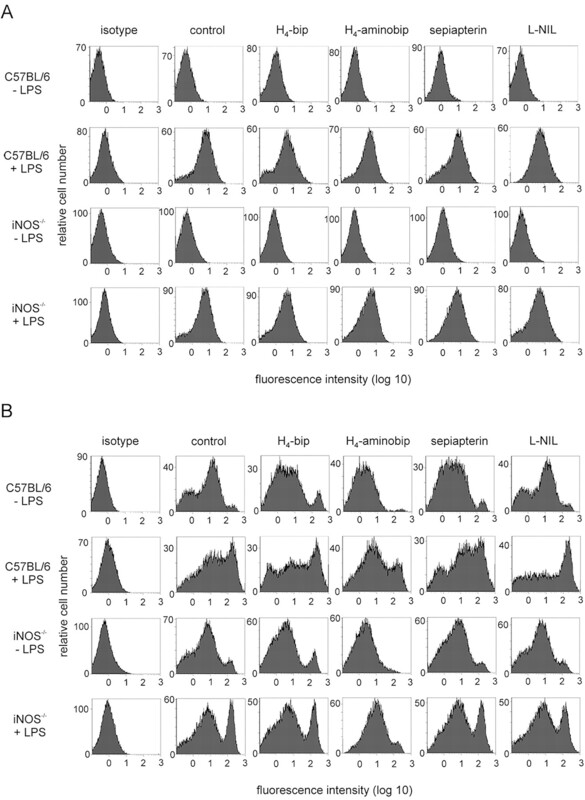 B, MHC class II expression in wild-type and iNOS−/− dendritic cells. Note the marked reduction of those dendritic cells that express MHC class II at highest levels by H4-aminobiopterin. Abs used and FACS analysis are detailed in Materials and Methods. One representative of three experiments is shown. Expression of further costimulatory molecules of the B7 family was then assessed in wild-type dendritic cells. Neither CD86 nor CD80, B7-H1 or B7-DC were regulated by H4-aminobiopterin or H4-biopterin (Table I⇓). Only ICOS-L surface expression was altered by H4-aminobiopterin in that it attenuated the observed down-regulation by LPS, which was not seen for H4-biopterin (Fig. 4⇓A). ICOS-L mRNA levels as determined by quantitative PCR were not influenced by LPS, pteridines, or l-NIL and were similar in dendritic cells from wild-type and iNOS−/− mice, i.e., ∼1 × 10−5 mRNA copies per 18 S rRNA (data not shown). Further characterization of the effect of H4-aminobiopterin on MHC class II expression by assessing not only surface but also total MHC class II levels in permeabilized cells showed that H4-aminobiopterin did not affect the transport of MHC class II protein from intracellular stores to the surface (Fig. 4⇓B). 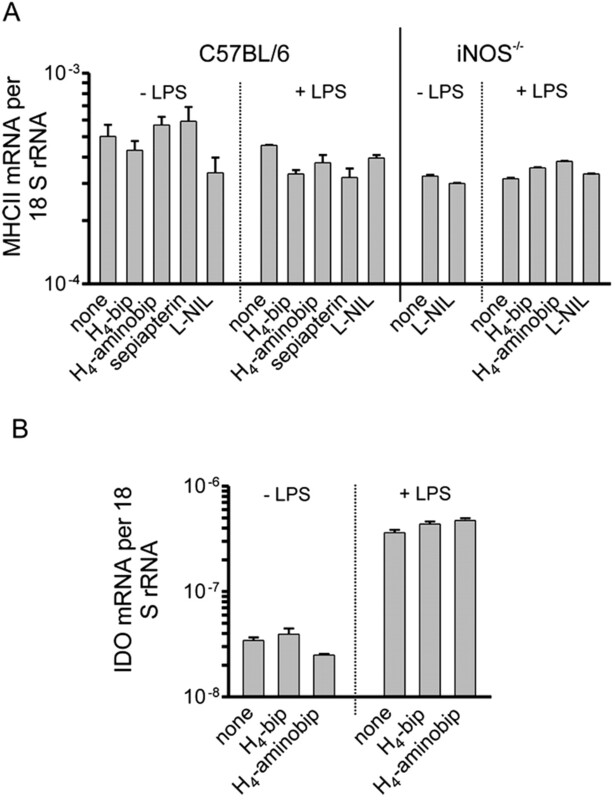 Also MHC class II mRNA levels remained unchanged (∼5 × 10−4 MHC class II mRNA copies per 18 S rRNA) in cells of both wild-type and iNOS−/− mice treated with pteridines or l-NIL alone or in combination with LPS (see Fig. 5⇓A). Therefore, H4-aminobiopterin appeared to affect overall MHC class II protein levels. ICOS-L and total MHC class II expression in C57BL/6 dendritic cells. Cells were treated with 500 μM H4-aminobiopterin or H4-biopterin in the absence or presence of LPS for 48 h. A, ICOS-L expression: isotype, light dotted line; untreated control, continuous line; H4-biopterin, gray peaks; H4-aminobiopterin, bold line. One representative of three experiments as well as the median of fluorescence of three independent experiments ± SD (in parentheses) are shown. ∗, Significantly different from control (p < 0.001, Student’s t test). B, Total MHC class II expression in permeabilized cells. A, Signification of lines as for ICOS-L expression. One representative of three experiments is shown. MHC class II and indoleamine-2,3-dioxygenase mRNA expression in dendritic cells after 24 h of treatment with various stimuli. A, Dendritic cells from C57BL/6 or iNOS−/− mice treated with pteridines or l-NIL in absence or presence of LPS. B, Dendritic cells from C57BL/6 mice treated with pteridines in absence or presence of LPS. The mean of triplicate determinations from two independent experiments ± SD is shown. For experimental details see Materials and Methods. Oxidative mitogenesis was used to assess the T cell priming capacity of dendritic cells from C57BL/6 wild-type or iNOS−/− mice treated with pteridines or l-NIL in absence or presence of LPS for 48 h. As can be seen from Fig. 6⇓, A and B, inhibition of iNOS by l-NIL in C57BL/6 wild-type dendritic cells increased T cell proliferation in response to both untreated and LPS-treated dendritic cells. This is in line with previous work on peritoneal macrophages (26) and is explained by the direct antiproliferative and proapoptotic effect of NO on T cells (reviewed in Ref.27). Accordingly, no effect of l-NIL was observed when dendritic cells from iNOS−/− animals were used (Fig. 6⇓, C and D). In contrast to l-NIL, H4-aminobiopterin attenuated the T cell activating potential of dendritic cells from both strains while H4-biopterin did not (Fig. 6⇓). Interestingly, the effect of H4-aminobiopterin was only weakly seen in wild-type cells treated with LPS (Fig. 6⇓B), whereas it was clearly more pronounced for immature and mature iNOS−/− dendritic cells (Fig. 6⇓, C and D). Also sepiapterin reduced T cell activation by dendritic cells from both strains albeit to a lesser extent than H4-aminobiopterin and not in presence of LPS (Fig. 6⇓). Because H4-aminobiopterin acts also as an inhibitor of dihydrofolate reductase (6), we tested whether this mechanism was involved in the T cell-antiproliferative effect of H4-aminobiopterin. However, providing thymidine and hypoxanthine, thus overcoming possible effects of dihydrofolate reductase inhibition on nucleotide metabolism (15), made no significant difference for H4-aminobiopterin-induced inhibition of T cell proliferation (data not shown). This indicated that inhibition of dihydrofolate reductase was not involved in the observed effects. T cell stimulatory capacity of dendritic cells from C57BL/6 and iNOS−/− mice. Cells were treated with 500 μM H4-biopterin (▵), H4-aminobiopterin (▿), sepiapterin (⋄), l-NIL (○), or left untreated (□) for 48 h in the absence or presence of LPS. Dendritic cells were then used for oxidative mitogenesis at different ratios and thymidine uptake was determined (see Materials and Methods). A, Immature C57BL/6 dendritic cells; B, mature C57BL/6 dendritic cells; C, immature iNOS−/− dendritic cells; D, mature iNOS−/− dendritic cells. Means of three independent experiments ± SD are shown. ∗, Significantly different from untreated controls (p < 0.05, Student’s t test). To test whether the observed H4-aminobiopterin-induced down-regulation of MHC class II expression on dendritic cells was functional in terms of impaired Ag presentation, we performed a MLR of H4-aminobiopterin-treated dendritic cells from C57BL/6 mice loaded with OVA peptide and T cells isolated from OT-II mice (16). As is shown in Fig. 7⇓, H4-aminobiopterin significantly impaired the Ag-specific T cell response to immature and, to a lesser extent, to LPS-matured dendritic cells. The inhibitory effect of H4-aminobiopterin was also clearly seen when gating for CD11c expression thus indicating that the compound indeed acted on dendritic cells (Fig. 7⇓B). Ag-specific T cell proliferation. Wild-type dendritic cells either left untreated (□) or treated (▵) with H4-aminobiopterin for 48 h were pulsed with OVA peptide 323–339 and then used in a MLR with T cells from OT-II mice (16 ). A, Immature dendritic cells; B, CD11c-positive immature dendritic cells; C, LPS-matured dendritic cells. One representative of three independent experiments is shown. Values are means of triplicate wells ± SD. ∗, Significantly different from untreated controls (p < 0.05, Student’s t test). To further clarify the effect of H4-pteridines on dendritic cells, we tested for cytokine production in dendritic cells as well as in MLR. As can be seen from Fig. 8⇓A, the amount of TNF-α- and IL-12-producing CD11c-positive cells was significantly reduced by H4-aminobiopterin but not by H4-biopterin. Accordingly, impaired production of IL-2 and IFN-γ was found in supernatants from MLRs using H4-aminobiopterin-pretreated dendritic cells for T cell activation (Fig. 8⇓B). H4-biopterin treatment had no such effect and even enhanced IL-2 production (Fig. 8⇓B). No IL-10-producing CD11c-positive cells or IL-10 and IL-4 production by T cells could be found in MLRs (Fig. 8⇓). Cytokine production in dendritic cells and in MLR. A, Immature C57BL/6 dendritic cells (CD11c-positive) treated for 4 h with LPS/anti-CD40 were stained for intracellular cytokine production as detailed in Materials and Methods. B, CD3-positive T cells from BALB/c mice were cocultured with immature C57BL/6 dendritic cells for three days for MLR. Cytokines in supernatants were measured by ELISA (see Materials and Methods). IL-10 and IL-4 were below the detection limit. Values are means of three independent experiments ± SD. ∗, Significantly different from LPS/anti-CD40-treated dendritic cells (A) or control MLRs (B) (p < 0.05, Student’s t test). 1, Untreated controls; 2, LPS; 3, LPS plus H4-biopterin; 4, LPS plus H4-aminobiopterin. Unlike in the case of pretreating dendritic cells with the test substances (see above), adding H4-pteridines for 48 h directly to the oxidative mitogenesis cultures caused complete inhibition of T cell proliferation, whereas sepiapterin or l-NIL had no such effect (Fig. 9⇓A). The complete lack of T cell response was caused by efficient apoptosis of T cells (Fig. 9⇓B). In recent work using RAW264.7 cells, we found that H4-pteridines induced apoptosis via formation of hydrogen peroxide (20). Therefore, we tested for the effect of catalase on T cell survival and found that only H4-biopterin-induced apoptosis but not H4-aminobiopterin-induced apoptosis was efficiently attenuated by catalase (Fig. 9⇓B) thus indicating that H4-aminobiopterin-induced apoptosis of T cells involved effects additional to formation of hydrogen peroxide. Catalase also restored T cell proliferation of H4-biopterin-treated cultures more efficiently than of H4-aminobiopterin-treated cells (Fig. 9⇓C). Effect of H4-pteridines, sepiapterin, and l-NIL as well as of catalase on T cells. A, T cell proliferation in oxidative mitogenesis with immature dendritic cells and T cells from C57BL/6 mice. Dendritic cell-T cell cocultures were left either untreated (□) or supplemented with 500 μM H4-biopterin (▵), H4-aminobiopterin (▿), sepiapterin (⋄), or l-NIL (○) for 48 h. B, Apoptosis of T cells mixed with dendritic cells at a 30:1 ratio upon addition of various concentrations of H4-biopterin (□) or H4-aminobiopterin (▵) in the absence (filled symbols) or presence (open symbols) of 100 U/ml catalase. C, Influence of catalase (cat) on oxidative mitogenesis of wild-type dendritic cells and T cells mixed at a ratio of 30:1 and treated with 500 μM H4-biopterin or H4-aminobiopterin. Means of three experiments ± SD are shown. ∗, Statistically significant difference between H4-biopterin and H4-aminobiopterin in presence of catalase (p < 0.05, Student’s t test). As introduced above, H4-aminobiopterin appears to have immunosuppressive effects that are not directly linked to its ability to inhibit iNOS (7, 8). Therefore, we explored its effect on two of the key players of the immune response, i.e., dendritic cells and T cells. As we found, H4-aminobiopterin reduced the capacity of dendritic cells to stimulate T cells and induced rapid apoptosis of T cells. It thus appears that H4-aminobiopterin can affect the immune response at different levels and in a cell-type-specific way. Data obtained with cells from iNOS−/− mice clearly showed that none of these effects is caused by iNOS inhibition. On dendritic cells, H4-aminobiopterin had no proapoptotic effect as on T cells (this study) or RAW264.7 cells (20) but affected dendritic cell function by reducing their ability to stimulate T cell proliferation. Besides ICOS-L (see below), MHC class II was the only marker from a panel of seven molecules involved in T cell activation whose expression was influenced by H4-aminobiopterin. The down-regulation of the MHC class II expression appeared to be specific for the compound because it was not seen with H4-biopterin. MHC class II expression was also not altered by sepiapterin, l-NIL, or in iNOS−/− dendritic cells. This indicates that the effects of H4-aminobiopterin on MHC class II expression are not due to inhibition of iNOS and also cannot be explained by the redox properties or possible NO-scavenging effect of the compound (20, 21, 25). H4-Aminobiopterin-treated dendritic cells also produced less proinflammatory cytokines, i.e., TNF-α and IL-12. 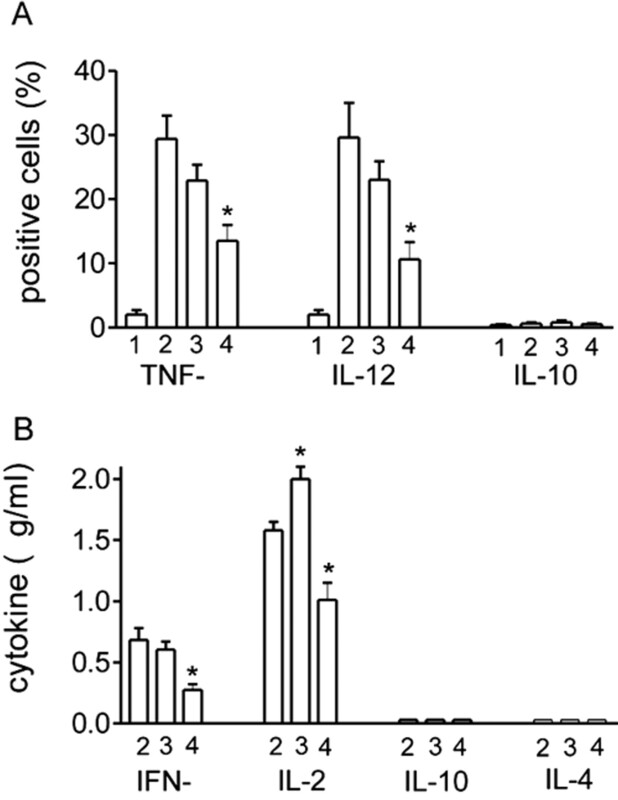 Both down-regulation of MHC class II surface expression and reduced production of proinflammatory cytokines by dendritic cells can account for the reduced T cell proliferation as is reflected by reduced [3H]thymidine incorporation in MLR, and impaired IL-2 and IFN-γ production (28). The lack of IL-10-producing dendritic cells that could induce formation of regulatory T cells (29) as well as the lack of IL-10 production in MLRs that could render dendritic cells tolerogenic (30) indicates that the immunosuppressive effects of H4-aminobiopterin cannot be explained by generation of regulatory T cells in this experimental setting. Moreover, the lack of IL-4 production in MLRs in parallel to reducing production of proinflammatory cytokines also shows that the immunosuppressive effect is not caused by a switch from Th1 to Th2 response. In MLRs, T cell proliferation was stimulated by l-NIL in wild-type but not in iNOS−/− cells (as expected according to previous work (26, 27)), whereas H4-aminobiopterin had the opposite effect thus underlining again that iNOS inhibition was not involved in the observed effects. Also sepiapterin reduced the capacity of dendritic cells to stimulate T cell proliferation although to a lesser degree than H4-aminobiopterin. The mechanism for this is currently unclear but it may be related to its scavenging properties under certain experimental conditions (21). 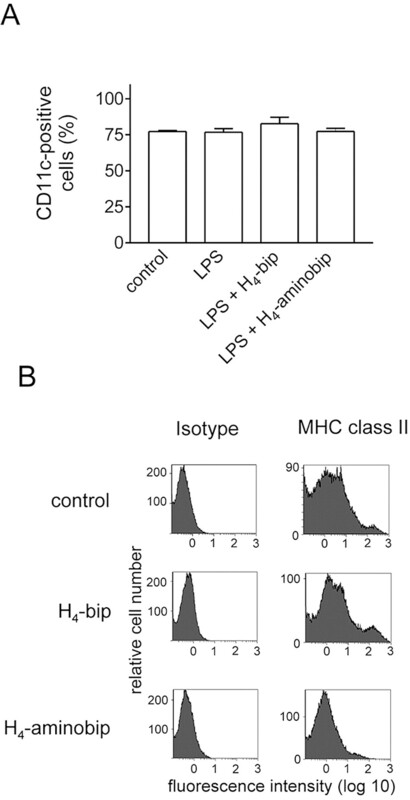 Interestingly, reduction of MHC class II expression by H4-aminobiopterin was more pronounced in immature than in LPS-matured dendritic cells, which may be explained by the very strong induction of MHC class II-positive cells by LPS, which cannot be fully counteracted by H4-aminobiopterin (Fig. 3⇑B). This is also indicated by the observation that cultures of LPS-matured dendritic cells treated with H4-aminobiopterin still contained some highly MHC class II-positive cells that can induce T cell proliferation while in immature dendritic cells no such population was observed (Fig. 3⇑). As is shown here, H4-aminobiopterin did not affect MHC class II mRNA levels or the distribution pattern of MHC class II protein but rather reduced overall MHC class II protein levels. The mechanism for this effect remains to be clarified. However, because maturation of dendritic cells as it is induced, e.g., by LPS (31), leads to stabilization of MHC class II molecules by prolonging MHC class II protein half-life (32), a possible mechanism for down-regulation of MHC class II protein levels by H4-aminobiopterin could be that the compound affects protein stability. Also other mechanisms like, e.g., decreased translation of MHC class II mRNA could account for this effect of H4-aminobiopterin. In addition to MHC class II expression, H4-aminobiopterin also affected surface expression of ICOS-L, a costimulatory member of the B7 family that is involved in regulating T cell activation (33). To our knowledge, down-regulation of ICOS-L surface expression in the course of LPS-induced maturation of dendritic cells was so far not reported. In human dendritic cells derived from CD14+ monocytes, maturation through LPS, TNF-α, or CD40 did not alter ICOS-L expression and the only agent from a panel of proinflammatory stimuli including LPS that was able to induce ICOS-L surface expression in human CD14+ monocytes was IFN-γ (33). It is currently unclear, whether and, if yes, how the comparatively moderate (∼3-fold) down-regulation of ICOS-L expression on LPS-matured murine dendritic cells would affect T cell activation. However, H4-aminobiopterin antagonized this maturation effect of LPS, not by altering mRNA levels but by increasing ICOS-L protein levels. The effect of H4-aminobiopterin on T cells was complementary to its effect on dendritic cells in that the compound very efficiently induced apoptosis of T cells. Unlike in RAW264.7 cells where we could show that the proapoptotic effect of H4-aminobiopterin was entirely related to formation of hydrogen peroxide due to auto-oxidation of the compound (20), this was not the case for primary T cells. Accordingly, catalase could not efficiently prevent H4-aminobiopterin-induced apoptosis or restore the T cell response while it did so for the H4-biopterin effects. Presently, it is unclear why the two H4-pteridines appear to operate by an identical mechanism, i.e., formation of hydrogen peroxide, in RAW264.7 cells (20), whereas this is not the case in primary T cells. However, the chemistry of reduced pteridines is very complex, and cell type-specific biochemical features such as, e.g., redox status, catalase, or glutathione content, therefore, might influence their behavior in various experimental settings (reviewed in Ref.21). Future work will aim to clarify whether the apparent hydrogen peroxide-independent part of the H4-aminobiopterin effect on T cells is related to its redox activity or to another mechanism. In summary, our work shows that H4-aminobiopterin can directly interfere with function (dendritic cells) and survival (T cells) of the key players of the immune response. Dendritic cells as a target of immunosuppressive drugs have only been recently acknowledged since it became clear that many of the well established immunosuppressive drugs not only affect lymphocytes but interfere with dendritic cell development and function at virtually any stage (34). As we show here, H4-aminobiopterin fits well into this concept by affecting dendritic cell function and T cell survival. The complexity of the H4-aminobiopterin chemistry makes it difficult to distinguish between its different properties. However, the observed effects neither involve inhibition of iNOS nor can they be attributed to formation of hydrogen peroxide due to auto-oxidation. They also cannot be explained by an effect of H4-aminobiopterin on indoleamine 2,3-dioxygenase (see Fig. 5⇑B), an enzyme that was recently identified as a key player for tolerance induction in T cells (35). Therefore, we conclude that the compound has additional not yet clarified properties that account for its immunosuppressive effect and anticipate that further chemically related substances could be developed to optimize for its immunosuppressive action. ↵1 This work was supported by the Austrian Research Funds “Zur Förderung der Wissenschaftlichen Forschung”, Grants 14949 (to N.R. ), 16021 (to C.H. ), and 16188 (to. E.R.W.). ↵2 G.T. and P.S. contributed equally to this work. ↵4 Abbreviations used in this paper: iNOS, inducible NO synthase; H4-biopterin, (6R)-5,6,7,8-tetrahydro-l-biopterin; H4-aminobiopterin, 2,4-diamino-6(R,S)-6-(l-erythro-1′,2′-dihydroxypropyl)-5,6,7,8-tetrahydropteridine; ICOS-L, ICOS ligand; l-NMMA, NG-monomethyl-l-arginine; l-NIL, N6-(1-iminoethyl)-l-lysine; NOS, NO synthase. Werner, E. R., G. Werner-Felmayer. 2002. Biopterin analogues: novel nitric oxide synthase inhibitors with immunosuppressive action. Curr. Drug Metab. 3: 119-121. Werner, E. R., A. C. F. Gorren, R. Heller, G. Werner-Felmayer, B. Mayer. 2003. Tetrahydrobiopterin and nitric oxide: mechanistic and pharmacological aspects. Proc. Soc. Exp. Biol. Med. 228: 1291-1302. Werner, E. R., E. Pitters, K. Schmidt, H. Wachter, G. Werner-Felmayer, B. Mayer. 1996. Identification of the 4-amino analog of tetrahydrobiopterin as dihydropteridine reductase inhibitor and potent pteridine antagonist of rat enuronal nitric oxide synthase. Biochem. J. 320: 193-196. Mayer, B., C. Q. Wu, A. C. F. Gorren, S. Pfeiffer, K. Schmidt, P. Clark, D. J. Stuehr, E. R. Werner. 1997. Tetrahydrobiopterin binding to macrophage inducible nitric oxide synthase: heme spin shift and dimer stabilization by the potent pterin antagonist 4-amino-tetrahydrobiopteirn. Biochemistry 36: 8422-8427. Schmidt, K., G. Werner-Felmayer, B. Mayer, E. R. Werner. 1999. Preferential inhibition of inducible nitric oxide synthase in intact cells by the 4-amino-analogue of tetrahydrobiopterin. Eur. J. Biochem. 259: 25-31. Brandacher, G., Y. Zou, P. Obrist, W. Steurer, G. Werner-Felmayer, R. Margreiter, E. R. Werner. 2001. The 4-amino analogue of tetrahydrobiopterin efficiently prolongs murine cardiac-allograft survival. J. Heart Lung Transplant 20: 747-749. Bahrami, S., F. Fitzal, G. Peichl, H. Gasser, W. Fürst, A. Banerjee, W. Strohmaier, H. Redl, G. Werner-Felmayer, E. R. Werner. 2000. Protection against endotoxemia in rats by a novel tetrahydrobiopterin analogue. Shock 13: 386-391. Winlaw, D. S., C. G. Schyvens, G. A. Smythe, Z. Y. Du, S. P. Rainer, R. S. Lord, P. M. Spratt, P. S. Macdonald. 1995. Selective inhibition of nitric oxide production during cardiac allograft rejection causes a small increase in graft survival. Transplantation 60: 77-82. Worall, N. K., W. D. Lazenby, T. P. Misko, T. S. Lin, C. P. Rodi, P. T. Manning, R. G. Tilton, J. R. Williamson, T. B. Ferguson. 1995. Modulation of in vivo alloreactivity by inhibition of inducible nitric oxide synthase. J. Exp. Med. 181: 63-70. Pieper, G. M., V. Nilakantan, G. Hilton, X. Zhou, A. K. Khanna, N. L. N. Halligan, C. C. Felix, B. Kampalath, O. W. Griffith, M. A. Hayward, A. M. Roza, M. B. Adams. 2004. Variable efficacy of N6-(1-iminoethyl)-l-lysine in acute cardiac transplant rejection. Am. J. Physiol. 286: H525-H534. Mannon, R. B., K. Roberts, P. Ruiz, V. Laubach, T. M. Coffman. 1999. Inducible nitric oxide synthase promotes cytokine expression in cardiac allografts but is not required for efficient rejection. J. Heart Lung Transplant. 18: 819-827. Szabolcs, M. J., N. Ma, E. Athan, J. Zhong, M. Ming, R. R. Sciacca, J. Husemann, A. Albala, P. J. Cannon. 2001. Acute cardiac allograft rejection in nitric oxide synthase-2−/− and nitric oxide synthase-2+/+ mice. Circulation 103: 2514-2520. Koglin, J.. 2000. Pathogenetic mechanism of cardia allograft vasculopathy–impact of nitric oxide. Z. Kardiol. 89: IX/24-27. Nichol, C. A., G. K. Smith, D. S. Duch. 1985. Biosynthesis and metabolism of tetrahydrobiopterin and molybdopterin. Annu. Rev. Biochem. 54: 729-764. McLellan, A. D., G. Terbeck, T. Mengling, G. C. Starling, P. A. Kiener, R. Gold, E. B. Brocker, M. Leverkus, E. Kämpgen. 2000. Differential susceptibility to CD95 (Apo-1/Fas) and MHC class II-induced apoptosis during murine dendritic cell development. Cell Death Differ. 7: 933-938. Austyn, J. M., R. M. Steinman, D. E. Weinstein, A. Granelli-Piperno, M. A. Palladino. 1983. Dendritic cells initiate a two-stage mechanism for T lymphocyte proliferation. J. Exp. Med. 157: 1101-1115. Heller, R., A. Unbehaun, B. Schellenberg, B. Mayer, G. Werner-Felmayer, E. R. Werner. 2001. l-Ascorbic acid potentiates endothelial nitric oxide synthesis via a chemical stabilization of tetrahydrobiopterin. J. Biol. Chem. 276: 40-47. Thoeni, G., E. R. Werner, G. Werner-Felmayer. 2004. Tetrahydropteridines suppress gene expression and induce apoptosis of activated RAW264.7 cells via formation of hydrogen peroxide. Free Radic. Biol. Med. 37: 375-385. Werner-Felmayer, G., G. Golderer, E. R. Werner. 2002. Tetrahydrobiopterin biosynthesis, utilization and pharmacological effects. Curr. Drug Metab. 3: 159-173. Schmidt, H. H., T. D. Warner, M. Nakane, U. Förstermann, F. Murad. 1992. Regulation and subcellular location of nitrogen oxide synthases in RAW264.7 macrophages. Mol. Pharmacol. 41: 615-624. Miles, P. R., L. Bowman, A. Rengasamy, L. Huffman. 1998. Constitutive nitric oxide production by rat alveolar macrophages. Am. J. Physiol. 274: L360-L368. Connelly, L., A. T. Jacobs, M. Palacios-Callender, S. Moncada, A. J. Hobbs. 2003. Macrophage endothelial nitric-oxide synthase autoregulates cellular activation and pro-inflammatory protein expression. J. Biol. Chem. 278: 26480-26487. Mayer, B., P. Klatt, E. R. Werner, K. Schmidt. 1995. Kinetics and mechanism of tetrahydrobiopterin-induced oxidation of nitric oxide. J. Biol. Chem. 270: 655-659. Hoffman, R. A., J. M. Langrehr, K. E. Dull, S. A. McCarthy, M. L. Jordan, R. L. Simmons. 1994. Macrophage synthesis of nitric oxide in the mouse mixed leucocyte reaction. Transpl. Immunol. 2: 313-320. Bronte, V., P. Serafini, A. Mazzoni, D. M. Segal, P. Zanovello. 2003. l-Arginine metabolism in myeloid cells controls T-lymphocyte functions. Trends Immunol. 24: 302-306. Heufler, C., F. Koch, U. Stanzl, G. Topar, M. Wysocka, G. Trinchieri, A. Enk, R. M. Steinman, N. Romani, G. Schuler. 1996. Interleukin-12 is produced by dendritic cells and mediates T helper 1 development as well as interferon-γ production by T helper 1 cells. Eur. J. Immunol. 26: 659-668. Pierre, P., S. J. Turley, E. Gatti, M. Hull, J. Meltzer, A. Mirza, K. Inaba, R. M. Steinman, I. Mellman. 1997. Developmental regulation of MHC class II transport in mouse dendritic cells. Nature 388: 787-792. Aicher, A., M. Hayden-Ledbetter, W. A. Brady, A. Pezzutto, G. Richter, D. Magaletti, S. Buckwalter, J. A. Ledbetter, E. A. Clark. 2000. Characterization of human inducible costimulator ligand expression and function. J. Immunol. 164: 4689-4696. Hackstein, H., A. W. Thomson. 2004. Dendritic cells: emerging pharmacological targets of immunosuppressive drugs. Nat. Rev. Immunol. 4: 24-34.